Huꞌmau ma melugu bonaꞌi asaga kumu lagaꞌa besinaꞌmu luto sipi ginaga nofigo gi moneko panaꞌasi ho lifigo limiꞌehina. Asaga bonaꞌmagi aitoga keheli uleꞌale hite komopaꞌani molo emite mefililana minoba minoba hilanaꞌmu yabe. Yes the heart moving message that God sent his only son so that all who believe in him will have eternal life. And let me tell you, it becomes more clear because it is in the heart language. 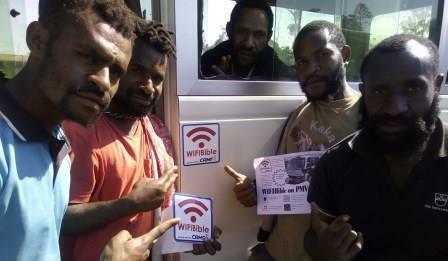 More languages can be found on the WiFi Bible Box on the PMV’s with the WiFi Bible sticker. 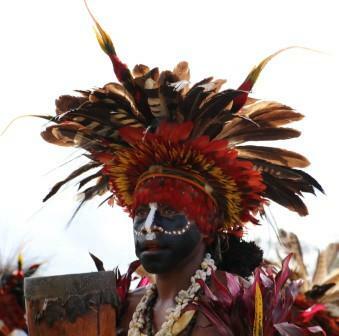 The main arena at the recent Goroka show was filled with colourfully dressed people from different provinces. They were dressed differently but they would all fit in the Melanesian traditional dressing for celebrations category. The only distinct difference would be the songs they sang in their own mother tongue, their heart language! In our previous WiFi Bible blog stories, we shared about our excitement because of the number of PMV owners who allowed us to install on their vehicles. You would have noted too that stickers were becoming more attractive that some PMV operators wanted the WiFi stickers without the WiFi Bible device! The reason for our excitement in this article is that during one of the installs the crew members of one of the bus discovered that their heart language – Benabena was on the WiFi Bible! They could not stop smiling as Carolyn did a demo of how to assist passengers to download resources onto their mobile phones. We saw the same excitement for the Adzera speakers during the Markham District Youth Camp in December of 2017. I also saw it in the face of my friend Samuel Saleng a Numanngan speaker who downloaded the Scriptures in his heart language at our front counter. We are more excited because passengers can go through the 200 plus languages that are on the WiFi Bible box to download the Scriptures in their heart language. 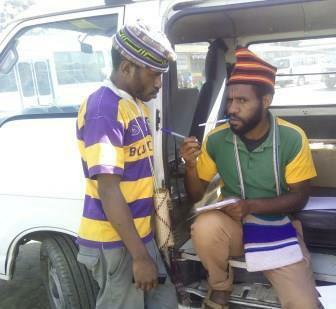 We thank the Lord for the partnership of PNG Bible Translation Association (BTA) for the permission to distribute. We get excited in so many situations and for different reason but it all boils down to one main reason; that it involves something very close to our lives and something we can identify with. Our prayer is that the travelling public who get on the WiFi Bible PMV’s will discover their heart language and get excited to learn about the promises of God in their heart language.